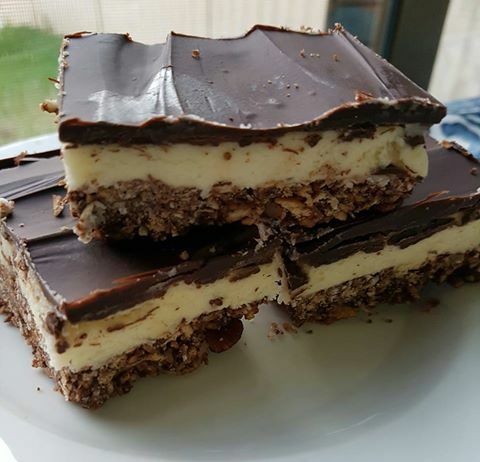 I went through a phase of making these wonderful bars about once a week, a few years ago. They are super delicious, keep well and are so simple when made in the CC. They are named after the city Nanaimo, in British Columbia, Canada. They are apparently very popular in Canada and across North America. So popular are they that in the 80s there was a push to have them named Canada's national dessert. I can see why - they are delightful. 2. Place butter in the bowl with the kneading blade. Set Sp 3, Temp 85, Time 2 minutes. 3. When program is complete, break biscuits in half and place in the bowl with the melted butter. 4. Pulse biscuits and butter for 4 seconds. Scrape down sides and pulse again for 4 seconds. 5. Add all other ingredients, adding egg last. 6. Set Sp 5, Time 20 seconds. When complete scrape down the bowl. Set Sp 5, 10 seconds. 7. Pour mixture into the prepared tin press down very firmly to create a smooth even base. 8. Bake in preheated oven for 10-15 minutes or until firm to the touch. 9. Remove from the oven and allow to cool completely. You can place the base in the fridge or freezer if you wish to speed up the process. 4. Set Sp 10, Time 20 seconds. 5. Place filling on the cooled base and spread out evenly. 6. Place tin in the freezer for 10-15 minutes or in the fridge for 30 minutes. 1. Place butter and chocolate in the bowl with the kneading blade. 2. Set Sp 3, Temp 85, Time 4 minutes. Continue in 30 second increments if ingredients are not completely melted. 3. Pour chocolate mixture over the chilled base. Work quickly to spread it out evenly and smooth it or make a pattern if desired. 4. Place in the fridge for at least 1 hour. When chilled use the overhanging baking paper to lift the bar from the tin and cut in to bars.